Did you see the 2012 Boss 302 on Speed Channel ? If you didn't have a chance to check out the 2012 Boss 302 on Speed Channel (January 5,2011) you missed out some interesting new information. If you had the opportunity to check out the previous post on the 2012 Mustang Boss 302 , you know that one of the the big secrets in it's development, was that all the specs and technology destined for the new car were put to the test at full throttle race conditions in the Boss 302R race car. What the show on the 2012 Boss 302 on Speed Channel showed was, that the end game for the 302R was nothing less than a one-two finish for the new car in Trans-Am. A pretty tall challenge for the new 5.0 Mustang Coyote engine, or any new engine for that matter. Along with the addition of the new 5.0 liter V8 were some traditional hot rod parts, designed to make this car more than a straight line performer. Brembo Brakes, sticky tires, a rear sway bar that was bigger than any Ford Mustang ever, and some slick technology, designed to ensure that the differential wasn't torn out of the car under the huge pressures. A special race only computer calibration was designed for the 302R. It's also the very same set up as you'll find in the 2012 Boss Track Key , a soon to be available option for Boss owners consisting of a dealer installed dual parameter computer (two separate modules integrated into the ECM)which can only be accessed by a special ignition key. This changes everything from cam timing, to shift quickness, throttle response and more. The engine even has a different sound! All well and fine. But what about the 2012 Ford Mustang? How does this all translate into a road car like the new Boss? Apparently very well! Watching the testing of the 2012 Boss 302 on Speed Channel revealed some interesting insights and goals. 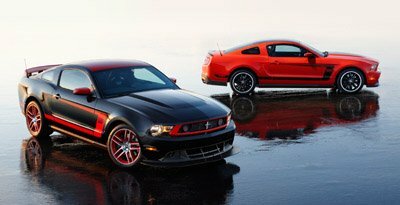 One of the goals for the new 2012 Mustang Boss, was to be able to outperform the BMW M3 in all the major areas, including handling, braking and acceleration. While quietly confident in their vision of what the new Mustang should be, the ultimate decision and critique of the package, was left up to their race testers and one other very important driver. Parnelli Jones, the man, largely responsible for all Boss 302 fame, following his 1970 Trans-Am win, was also there to test out the 2012 Boss Mustang. During questions from the track testers (race car drivers), a driver, asking about horsepower was told that with their tuning, they were able to crank out another 30-40 horsepower over the new Coyote 5.0 engine's 412 horsepower. Where was this added horsepower? At the top end - 7,200 rpm. One driver commented that the 2012 Boss 302 on Speed Channel he was testing, seemed to have no flat spots anywhere over the entire power band. Normally, with most powerplants, and particularly turbo cars, there is a lag in response, where the engine or turbo is not in it's sweet spot. In naturally aspirated engines, torque is not constant throughout the rpm range of the motor, making it necessary to be very careful about gear choice and rpm's, to keep the engine "happy". The 2012 Mustang coyote engine , along with the Boss specific tuning, seems to have worked to create a very smooth constant torque band. Translation, instant throttle response and lots of fun! Looking at the underside of the cars, you see a very unique four pipe exhaust system, with two pipes exiting to the side, race car style. Well insulated new cars, are quiet cars. But knowing that Boss enthusiasts would want to hear the sweet music from that massaged Coyote engine, Ford engineers decided to bring some of that V8 sound closer to the driver and passenger using the new side pipes. I had been guessing, for some time, since seeing the underside of the car, that the reason for the quad system, beyond lowering exhaust restrictions, just might be to allow you to run open exhaust for racing. Turns out I was right. Underneath the car, at the exit joints are flanges, which allow you to remove a restriction plate, open up the exhaust and run open pipes. What Did Parnelli Jones Think? 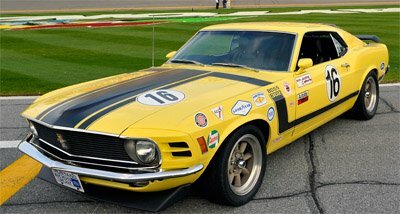 One of the coolest parts of the 2012 Boss 302 on Speed Channel episode, was the fact that Parnelli Jones, the man responsible for the Trans-Am win in 1970 that made the Boss 302 famous, was involved in evaluation of the new 2012 Boss 302 and Boss Laguna Seca. If you were thinking, yeah, just for pictures, I wouldn't blame you, but you'd be wrong. Each tester, including Parnelli, would take the Boss out onto the track, work up some lap speed and then come back in to give their impressions and critiques. This input was to be later used and incorporated into the final design of both, the 2012 Boss 302 and the Boss Laguna Seca. Several race testers took the wheel and cranked out some very respectable times. And the comments were more than enthusiastic. Several testers, after driving these new cars, suggested that the Ford Boss 302 engineers' goal of beating the BMW M3 was setting their sights much too low! There were going to be a lot of exotic cars that were going to be embarrassed by these new cars. When it was his turn, Parnelli Jones accelerated onto the track, returning to say that it was everything that they said it would be, and the right car at the right time to be wearing the "Boss" name. Then, after a turn with another race tester, Jones decided he hadn't quite had enough of the new car and jumped back in for yet another round. He then proceeded to set the fastest lap of the day in the new Boss Mustang. Not bad for a 77 year old! I haven't heard yet, whether there will be re-runs of the 2012 Boss 302 on Speed Channel, but if there is, I really recommend that you check it out. Beyond all the details mentioned earlier, is something you just can't get from specs and pictures. That's the sound of that Boss Coyote engine, pulling out of corners and winding out full throttle at 7,200 rpm on the straightaways. The other thing that really makes this program, is not just hearing the engineers and drivers talk about the cars, but the genuine emotion on their faces, that tell you that they know this is no ordinary car and nothing but the best possible car they could design, would be good enough to wear the legendary Boss 302 name.